As mentioned in my last blog article, a strategic human resources plan is a process that identifies current and future human resources needs for an association to meet its vision and mission. To ensure your association is performing at its highest level, there should be a link between human resources management and the strategic plan of your association. There should also be clear and concise policies and procedures within the organization to identify human resource efficiencies. 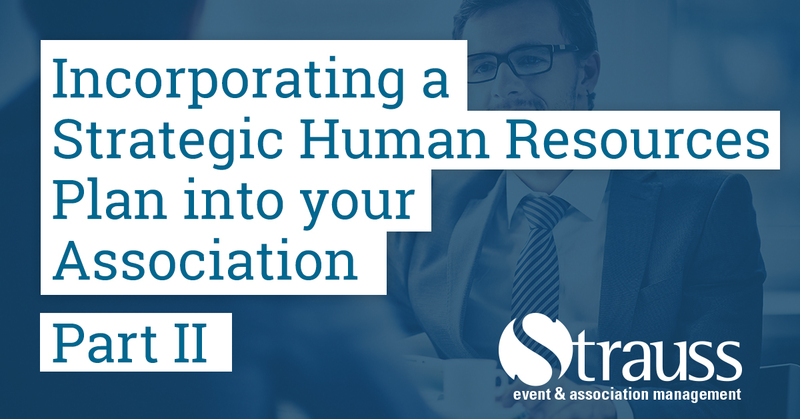 The reason for strategic human resources planning is to ensure that your association has the right human resources it needs to achieve the strategic goals of the association. Having a strong human resources plan will also benefit the association and ensure that it is a high performing association. The association manager should be assessing employees’ performance and inventory beyond the skills they are currently performing in their positions. The manager should then have an open discussion with employees about what contributions they can bring, and what additional responsibilities can potentially be added to their roles. Taking the time to perform regular evaluations will increase employee satisfaction, which will benefit the association in the long-term. Motivating, encouraging and collecting feedback from staff will aid in employee retention. Reducing the costs of employee searches and training and will allow for the strategic human resources plan to correlate with the organization’s strategic plan. Evaluation should be ongoing and consistent. Communications should be allotted for the year and call for responses from employees to ensure they are satisfied in their positions. This will help to ensure that each team member understands the mission of the association and can see that working together can make the association one of a high-performance level. After developing your human resources strategic plan, regular follow-up should occur by the association manager and other members of the leadership team. Benchmarks should be identified and measured to determine if the plan was successful. Associations must also accommodate their staff and ensure that there is a high level of staff satisfaction. Ultimately without this, the organization cannot be a high performing association. These areas should be evaluated and recommendations on how to ensure staff satisfaction and success for the association should be identified. An action and evaluation plan should be created and used throughout the operations of the association. Crucial steps to continue to remain a high performing association are strategic and imperative for excellence in human resource policy and procedures. There are solutions to the issues identified that can aid in employee retention and maximizing in employee knowledge and experience. Incorporating a strategic human resource plan into the general operations of the association will help to prepare the association for current and future human resource needs. Factoring in the association’s strategic direction to take inventory of the current staff and if the association has the staffing available to complete the tasks in the strategic plan. The association leaders need to understand that there is a battle for work-life balance among employees. Accommodations should be considered to make the work environment more flexible while allowing staff to work remotely when needed. Staff should be provided motivation that is not just salary-related, recognizing that all staff will have various motivational factors. Vacation time, reduced hours on special days, and more can provide staff with the sense of appreciation and respect. Staff recruitment is costly in hiring a consultant to do an employee search. Training is costly in staff time and it takes a lot of time to train the right person to understand the strategic direction of the association. Empowering current staff to set personal goals and to find out their personal motivation and encourage new initiatives, will help to maintain a strong employee base. Having this tool accessible always to all staff will allow for staff to know what is expected of them and what policies are in place for them. It can be a fair document to ensure that all staff are compensated in a consistent manner as well. In conclusion, working with the staff of the association to ensure that their satisfaction is met will ultimately lead towards developing a strategic human resources plan, which will prepare the association for the future as it continues to grow and provide outstanding value to its members.